This paper was originally presented to the International Conference on Interdisciplinary Musicology, Staatliches Institut für Musikforschung, Berlin, Germany, 4-6th December 2014. Understanding the technical and creative complexities of networked music performance provides the starting point for the analysis of the 2014 Flight of the Sea Swallow collaboration between networked musicians in New York, USA, Sydney, Australia and Braunschweig, Germany. 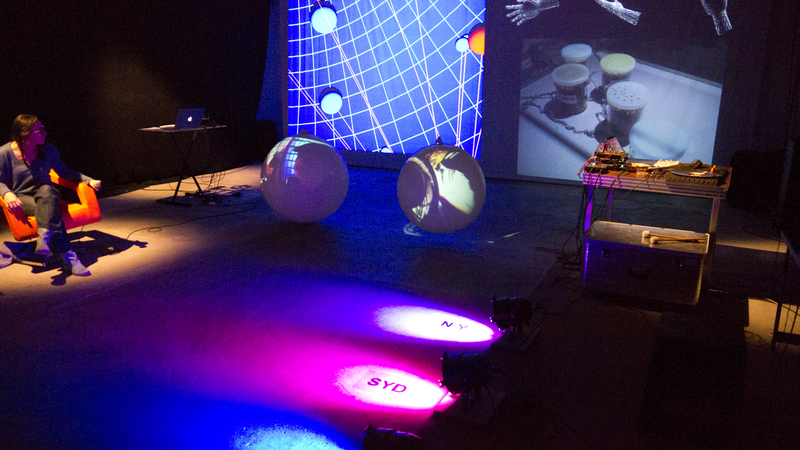 Performers interacted remotely by navigating a 3-D audiovisual environment with wristbands containing accelerometers, visualised as animated hands within the virtual space. Heat and light sensors in each location generated data that was visualised as coloured lighting states within the physical performance space, reflecting those characteristics of the dispersed performers sensate environments. Drawing on multimodality, with its focus on the construction of meaning across multiple communicative modes, this paper examines the relationship between performers dislocated, technologically mediated interaction and the ways in which this shaped their improvisatory musical experience. The analysis examines the interplay between different modes of action, demonstrating the role that the body plays in the performer’s relationship to the technology used and conceptualisation of their creative networked engagement. Read entire article.